I can really appreciate simplicity in an automobile, especially a modern one. With so many cars having buttons everywhere, all kinds of super high-tech gadgetry, interiors that look like they belong in a sci-fi films, and powertrains that require a degree in astrophysics to fix, it can be refreshing to get into a vehicle that is easy to operate, simple to drive, and basic. That car would be a Nissan Versa Note. I reviewed the base-model 2012 Versa S sedan (no power windows, no power locks) and I became somewhat smitten with its minimalist personality. Simple, functional, no-frills, no-fuss transportation—hell, it even had crank windows. Remember those? 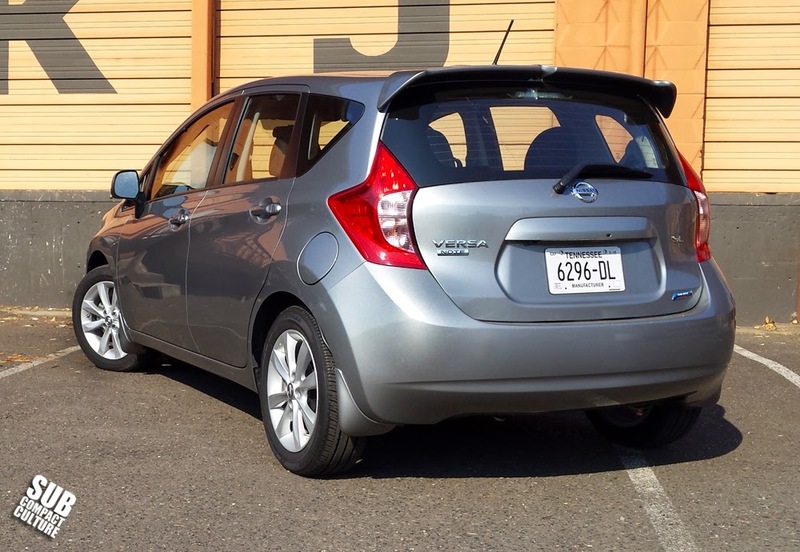 The Nissan Versa Note—the company’s five-door hatchback—takes the simplicity of the Versa sedan and turns it into a much more utilitarian package. This time, however, I spent time in the Versa Note SV. Whereas the S trim package doesn't include power windows, locks, or keyless, the SV includes all of this stuff and allows buyers to option the vehicle up further with the Tech Package, SL package, factory alloy wheels, and more. 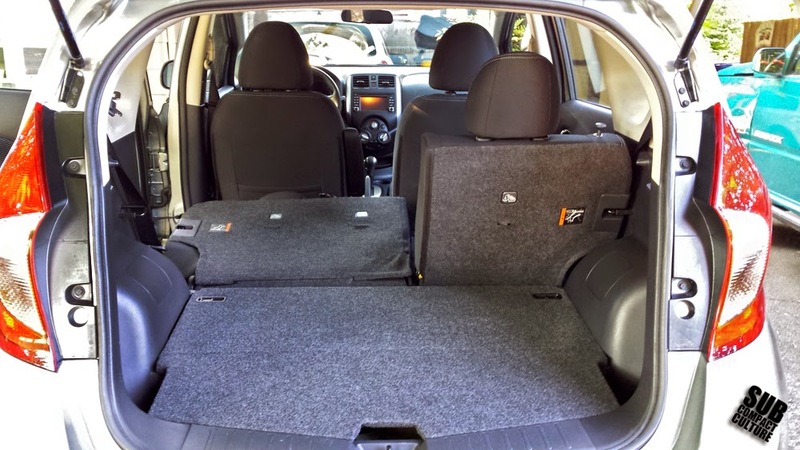 As with any hatchback, you get tons of practicality and cubic feet upon glorious cubic feet of usable space; certainly more than in a sedan. That rings true with the Note. The back seat folds down for plenty of space for cargo. If you’re hauling people instead of gear, you likely won’t get too many complaints from the back seat, as there’s lot-o-room back there for adults. The front heated cloth seats are equally comfy and all are extremely cushy. The padding feels like the same material you’d find in a Tempur-Pedic bed. The interior layout is simple and basic but in a good way. It doesn’t feel junky or poorly built, just simple, functional, airy, and easy to use. In fact, the Versa Note felt quite solid on the road. I’ve driven much more expensive cars with more rattles. Another neat feature of this optioned-up Note SV? A 360-degree camera system that helps in parking duty—very cool and practical. Oh—Bluetooth is standard, too. I did have a couple of interior issues, however. First was the car’s navigation system. It took an extremely long amount of time to load destinations. After what seemed to be forever to load, the nav did work well and clearly. Also, I could not find the exterior temperature gauge readout; I looked everywhere for it. However, according to Nissan’s website, the Note SV does feature a temp gauge. Apparently they just hide it. 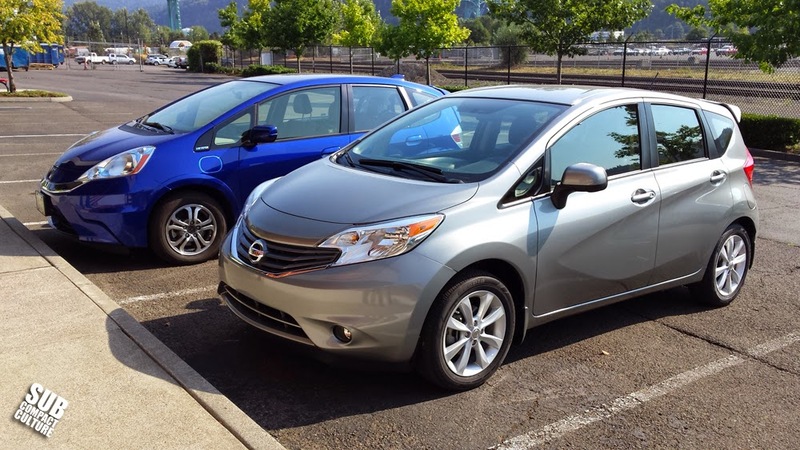 One cannot simply review the Nissan Versa Note and not talk about its uncanny resemblance to a certain Honda subcompact, namely, the pre-2015 Fit. Nearly everyone I’ve talked to about the Note says it looks like a Fit, and sure enough, there is a resemblance. This isn’t necessarily a bad thing, however. The Fit isn't a bad looking car. And while the Versa Note it isn’t exactly a head turner, it’s also not offensive. I was able to snap a picture of the Note next to a Fit EV and sure enough, there is definitely a resemblance. Powered by the same 1.6-liter four-cylinder engine as the Versa sedan, the Note makes 109 peak horsepower and 107 ft/lbs or torque, but only has to pull 2,485 lbs. All Notes, except for the S-model, are mated to the company’s omnipresent Xtronic CVT which allows the car to achieve 31 city, 35 combined, and 40 MPG mileage rating. Power is adequate at best; there isn’t a ton of get-up-and-go, as you might expect with only 109 hp. As with some other CVTs on the market, I noticed that when at a standstill in drive (“D”), the car shakes a bit. 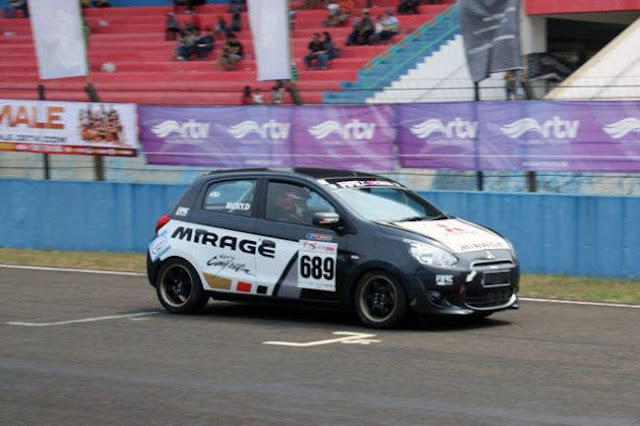 It’s not as bad as the Mitsubishi Mirage, but the vibration was noticeable and a bit annoying. The Note is nimble and excels in urban environments, although potholes and bad pavement can deliver rubbery kickback from the suspension. When on good pavement, however, the ride quality was quite compliant. Cornering is decidedly average but without major amounts body roll. I found the Note to have a hands-out driving position which is exaggerated by the lack of a telescoping steering column. The Note SV does have cruise control, which is great for highway driving, and the leather-wrapped steering wheel is a nice touch. Other accouterments include 16-inch alloy wheels, proximity key, fog lights, Divide-n-Hide adjustable cargo floor, and a cargo cover. 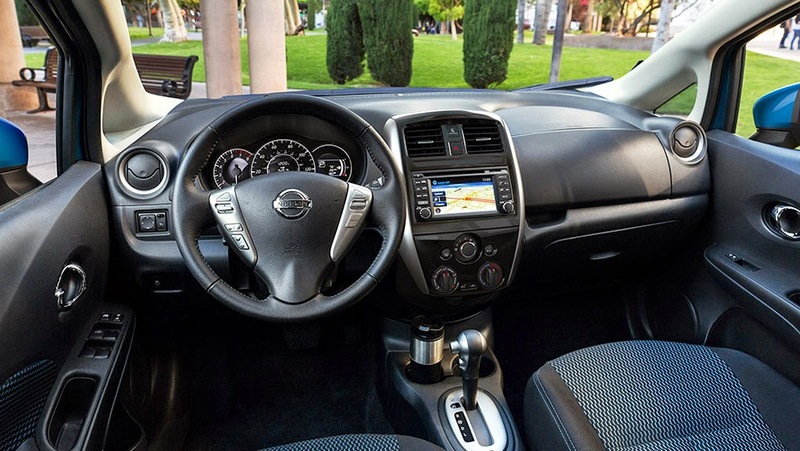 This Versa Note SV came with the optional Technology Package, which gets you the NissanConnect system with nav, 5.8” touch-screen monitor, Google Send-to-Car technology, Pandora capability, and that cool 360-degree camera system. All these options brought our Vera Note up to $20,015 including destination. I prefer the Versa Note in its more Spartan trim levels, such as the bare-bones S model (starting at $14,180 with the five-speed manual) or perhaps a SV model without all the tech bits (starting at $16,330 with the CVT). These seem like good deals to me. Our tester had nearly $4,000 worth of options, which makes this feel like an entry-level car with, well, a ton of stuff simply added on, versus a cohesive upscale small car. FYI, a fully decked-out top-of-the-line Note SL with every box checked comes to nearly $24,000. At $20,000 there are a lot of options in the small car segment, many of which offer a more upscale experience. 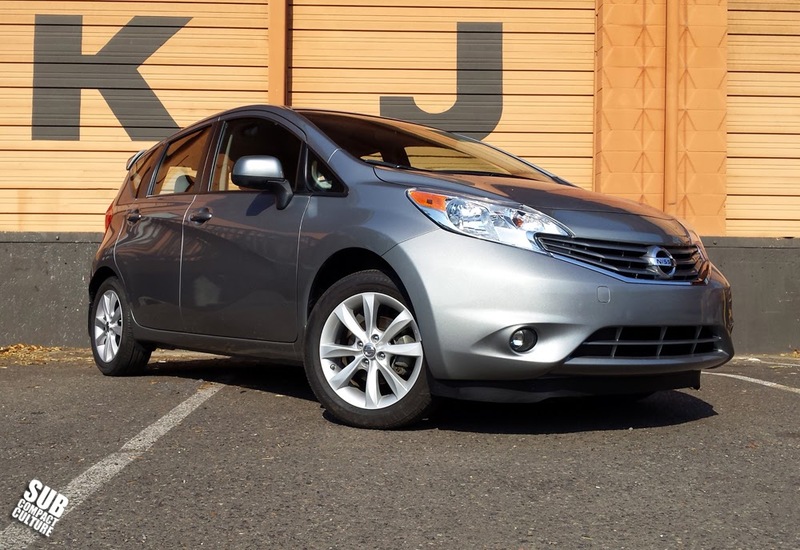 But if you can keep the options down and appreciate utility, solidity, and simplicity, the Nissan Versa Note is worth checking out. Here is my take after 4500 miles on the Versa NOTE [purchased end of April this year: agree the ride is quite solid and I also find it rather quiet and comfortable on reasonably good roads. This car is great on the highway and therefore much more than just an around town "grocery getter" as it was once described! I have the SV trim with the CVT which wife and I really like and wouldn't want to go back to a regular automatic. The wheels were (my preferred choice) optional 15" alloys, and the tires Bridgestone Ecopia EP 422 (OEM) low rolling resistance, and quite satisfactory. The car rolls along seemingly without effort due mostly perhaps because of the low drag features. Our gas mileage has been excellent: rarely under 40 mpg and as high as 43.5. These figs are for overall variety of driving with hills, mountains, stop and go, secondary, highway; mostly two people aboard. To sum up, the car looks good, seems well built, has good quiet ride (for class), and fantastic mpg's. What more could one want? (more power I suppose but at what expense?) 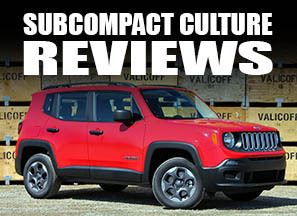 Would only recommend: an inch or more vertical height adjustment on the driver's side (why not--there is tons of head room), a bit brighter back up screen, and telescoping steering. I didn't find the so called "leather wrap" on the wheel very comfortable; seemed too thin and hard to me. An aftermarket wheel wrap solved this. So, enthusiastically recommend this car for good, practical and frugal transportation. No regrets here! I drove one of these as a rental, and while I appreciated the impressive economy, I found the CVT transmission to be a miserable, sluggish experience. Response was non-existent, and i needed to turn the "overdrive" off to get up to highway speeds on on-ramps. If economy is what you're after, and ALL you are after, the Versa fits the bill, but driving pleasure is non-existent as far as I'm concerned.